1. Just because you hand-pick some people to be part of your team, until they achieve a consistent rhythm of accomplishment through collaboration, they are merely a group. It’s best to engage (ha – no pun intended) people with different personalities and strengths, for the synergy will be heightened. So do the odds of potential discord – your challenge involves keeping everyone on track and focused on the goal. If a group is left on their own too soon, they may go out for tainted food and spend the afternoon in the bathroom. Not a very productive outcome. 2. Drinking is not a productive bonding activity. As someone who used to conduct seminars on an employer’s commitment to equal employment opportunities and sexual harassment prevention, many of the examples provided involved social/work situations and alcohol. When you’re with the team and when they’re with each other, everyone is on the company clock. As inconvenient as that may be, it’s also the reality of the workplace. Maybe you should consider bowling? 3. Don’t accept medication from people you don’t really get along with. 4. Realize that trust is an earned emotion and do whatever you can to make sure that it is never compromised. I’ve often said that it is the foundation of every successful relationship – professional or personal. It is also indicative of behavior that is consistent, reliable, informed and well-intended. Most critically though – it is fragile – and difficult to restore when broken. 5. Friends don’t let friends wallow. Neither do really good supervisors. Before you write-off a well-established employee, make sure you know whether a decline in performance is a result of a recent change in circumstances. If you can help him/her – do so. Performance does not sustain on a consistently positive trajectory – life gets in the way, bad days gets in the way, tragedy gets in the way. We have to move past the perception that everyone’s performance gets better and better and better every day, month, year. It’s just not true. One last thought, unless you’re Melissa McCarthy I don’t recommend trying to pick up a U.S. Marshall when traveling on business. What you do on your own time, is entirely up to you. Posted on May 23, 2012 by mimijk •	This entry was posted in discretion, humor, inspiration, leadership, management, motivation, work life and tagged Harvard Business Review, Kristen Wiig. Bookmark the permalink. 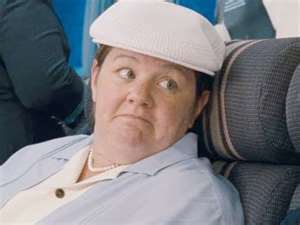 I confess I haven’t seen Bridesmaids, but this is hilarious nonetheless. I wonder what management lessons you might take away from a morning watching PBS Kids? I love it, Mimi! You are very, very clever. And having seen the negative effects of #2 in action, I couldn’t agree more. A brand new colleague once embarrassed herself *royally* at a company function by getting completed *s*#%! faced just one week into the job, and people *never* looked at her the same way again. Bad, bad, bad…..
Haha this is hilarious. You are fantastic. Never saw the movie, but this seems like pretty good advice. I live about 40 miles from the office so that precludes me from drinking at company events as they tend to be around the office. Nothing is worse than being completely sober and watching another manager make a completel fool of themselves. You can’t help but cast a few judgments. Great advice. Crafty and smiling throughout with an excellent Jacked-up finish. Well done Mimi. What a wonderful way to review movies. Love it. Thanks – I’ve done a few, and they’re so much fun to do!